Tapas have taken the world by storm. You can find tapas bars everywhere including Asia where I’ve seen Thai and Vietnamese “tapas” or “Cajun” tapas in New Orleans. The origin of tapas is a bit of a mystery, but the most commonly accepted theory is that Spanish bartenders at farmer’s bars would serve beer or sherry and “top” it with a small saucer to keep the flies and the dust out. Tapa literally means “a cover” or “a lid” – and this is a common thread to many tapas origin stories. It didn’t take bartenders long to realize that they could use the saucer to serve some nuts, a little ham, some olives, some cheese. This clever move made customers come back, thanks to the bar’s apparent generosity. 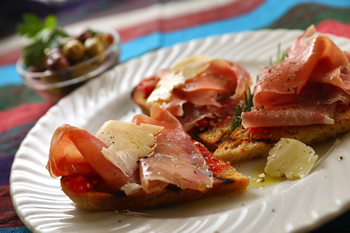 Another theory is that since tapas bars used to be standing only (no stools), customers who ordered a snack had nowhere to put their plate except on top of their glass – hence the tradition was born. Still another theory claims that some unscrupulous tavern keepers discovered that, if they covered cheap wine with a plate of strong cheese or meat, customers wouldn’t notice how bad the beverage was. 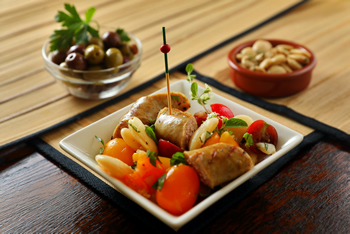 The tradition of serving small bites with drink to begin the meal (or make it a meal) is now wide spread and of course the holy grail for tapas is Spain and Portugal where you’ll find tapas bars everywhere. Following are some of my favorite tapas. Salud! This is one of the classics in Spanish tapas presentations. You’ll see the bread piled decoratively at the bar to be eaten as is or topped with shaved cheese such as Manchego, thinly sliced Serrano or Iberico ham, smoked salmon or other fish, white sardines, etc. You get the idea! I’ve included below a note from a diary that I kept on my first trip to Spain in 1994. Method: Take thick slices of good peasant style bread and grill or toast it so that it is just beginning to turn golden but still soft inside. Rub with a cut fresh garlic clove and then rub with a dead ripe tomato that has been cut in half and gently squeezed to remove seeds and excess moisture. As you are rubbing be careful not to moisten the bread too much. Serve immediately drizzled with a fragrant olive oil and a little sea salt either as is or as a base for other toppings. Cut the tomatoes in half and gently squeeze to remove seeds and excess moisture Place a grater over a large bowl. Rub the open face of the tomatoes into the grater until all the flesh is grated. Discard the skin. Add 2 or 3 tablespoons olive oil to the grated tomato and season to taste with salt. Toast the bread preferably over a wood fired grill. Spoon the tomato mixture over the slices of toast. Place a slice of ham on top of each. Drizzle with a little more oil and serve. This uses Spanish Chorizo which is a different animal than Mexican chorizo. Generally it’s a cured and dried meat more akin to salami rather than the raw spicy Mexican version. There are however uncured versions which is what I would suggest using here. In the Bay area my favorite is one made by 3 Sisters in Richmond, CA. The cured version is pretty dense and chewy. It’s available in good delicatessens and on line at sites like La Tienda www.tienda.com or in the Bay area at The Spanish Table www.spanishtable.com. Heat a sauté pan over medium heat. Add the olive oil, shallot and garlic and sauté for 2-3 minutes, or until softened. Add the chorizo to the pan and cook for a couple of minutes or until just beginning to crisp and the oil is released from the chorizo. Add the bay leaves, raisins, figs if using and red wine and cook until the wine has reduced to just coat the chorizo. Serve warm. This is one of the simplest of all tapas presentations and very delicious. Both the Manchego and membrillo are available in good cheese shops. You can also make your own membrillo. Joyce Goldstein’s new book Jam Session: A Preserving Handbook has a terrific recipe. You’ll need to get your hands on some fresh quince at the Farmer’s Market. Trim the rind from the Manchego cheese and shave with a vegetable peeler. Spread the quince paste on the bread and top with the shaved cheese. Run under a hot broiler or use a propane torch to melt the cheese a bit and serve immediately with the figs. Look for a good herbed fresh goat cheese or alternately mix in your own favorite fresh herbs. Piquillo peppers are available canned or jarred. See note below on why they are so special! Save any of the leftover garlic scented olive oil for other uses such as frying potatoes. Mash the goat cheese in a bowl with the zest. Stuff the whole piquillos three-quarters full with the mixture and place on a rimmed baking sheet. Heat the olive oil in a small saucepan and fry the garlic until lightly golden brown. Drain on paper towels. Drizzle the peppers with some of the oil and briefly broil in a preheated oven. If cheese oozes out just push it back in. To serve: Use a spatula to transfer to a platter or individual plates and top with the fried garlic and a grinding or two of pepper. Serve with a caper berry or two, if desired. Blanch the herbs in lightly salted, boiling water for 2 – 3 seconds. Drain and immediately plunge into ice water to stop the cooking and set the color. This blanching step inactivates the enzymes that cause the herbs to turn brown and develop an oxidized flavor. Squeeze the herbs dry, chop and add to a blender or food processor along with enough oil to cover. Blend to make a thick paste. Pour into a clean tall jar and cover with up to 2 inches of oil. Stir well and store covered in the refrigerator for at least 8 hours and preferably for a day or two depending on intensity of color and flavor desired. Season with a little salt and pepper if you want and store covered and refrigerated for up to 3 weeks. Wonderfully versatile piquillo peppers come exclusively from the small northern Spanish region of Navarra. Nestled between the borders of southern France and Basque territory, the town of Lodosa thrives on a busy trade in piquillo peppers. The peppers take their name from their distinctive, narrow, triangular shape: Piquillo means “beak” in Spanish. At first glance, piquillos look like a variant of sweet bell pepper, but just one bite will tell a different story, as the familiar sweetness gives way to a sneaky heat. Navarra’s piquillo peppers are traditionally roasted over a beechwood fire, which adds a delectable smokiness to their bouquet. The final product is then packed whole in its delicious juices, ready to be sliced, stuffed and puréed into a variety of delicious dishes. The key to this dish is to use the delicious oil packed tuna from Spain or Italy. The very best of it is labeled Ventresca which comes from the belly. Boquerones are special anchovies that are ubiquitous in tapas bars in Spain. They are not the intensely salty and fishy anchovies that most of us are used to. They are white, delicate and typically packed in a combination of oil and vinegar. You’ll find them refrigerated in plastic containers in good delicatessens and I’m addicted to them straight out of the container! Place egg yolks in a bowl and mash. Add the tuna, mayonnaise, lemon juice and capers and stir to mix thoroughly. Season to your taste with salt and pepper. Spoon the yolk mixture into the egg whites. You may have a little more filling than you’ll need which is not a bad thing! 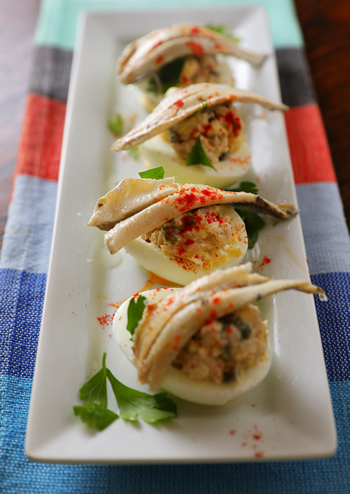 Arrange two anchovies on top of each egg and sprinkle with parsley and paprika. Bacalao – salt cod – is one of the great Spanish delights, adding flavor to bland ingredients such as potatoes. If you are unfamiliar with it, then this is a delicious way to try it out. Bite size fish cakes, dipped into rich, creamy, garlicky allioli, are irresistible as a tapas dish or appetizer. Cook the potatoes, unpeeled, in a pan of lightly salted boiling water for about 15 minutes or until tender. Drain. As soon as they are cool enough to handle, peel the potatoes, then mash with a fork or use a potato masher or ricer. Season with lemon juice and pepper to taste – the mixture may also need a little salt but taste it before adding any. Add one egg to the mixture and beat it until thoroughly combined, then chill until firm. Heat about 3/4-inch oil in a large, heavy frying pan. Add the fritters and cook over a medium-high heat for about 4 minutes. Turn them over and cook for a further 4 minutes on the other side, until crisp and golden. Drain on kitchen paper, then serve warm with the allioli and lemon wedges. En escabeche is a traditional method of preserving foods that was frequently used before refrigeration. Mussels can be substituted here. The clams or mussels will keep in the refrigerator for up to a week. Be sure to save the cooking liquid. It is a wonderful stock for soups, chowders and stews. Discard any clams or mussels that fail to close to the touch. In a stockpot, combine the clams with water to cover and add the wine. Bring to a boil, decrease the heat to low, and cook, shaking the pot occasionally for about 5 minutes, or until the clams open. Drain clams into a colander or large sieve set inside a large bowl. Save this liquid for other uses. Discard any clams or mussels that have not opened and let cool. Remove meat from the shells and discard the shells. Set aside. In a nonreactive deep sauté pan, heat the olive oil over medium heat. Add the onions, garlic, bay leaves, and peppercorns and cook, stirring occasionally, for about 10 minutes, or until the onion is soft but not brown. Using a slotted spoon, discard the garlic. Add the pimentón, salt, sugar and vinegar to the pan.. Mix well and decrease the heat to low. Add the clams, mixing well, and simmer until heated thru, about 4 minutes. Remove from the heat and allow the clams to cool in the brine. Transfer to a bowl, cover, and refrigerate until cold. Serve the clams cold with toothpicks for spearing or on spoons. Butifara sausage is one of the great treasures of Catalonia. It is also very popular in South American especially Peru. We are lucky to have it locally available, delicious version from Sonoma County Meat Company in Santa Rosa (www.sonomacountymeatco.com). This recipe makes more beans than you’ll need but that’s a good thing. They make a delicious salad or accompaniment to other grilled meats and poultry. Add the olive oil to a sauté pan over moderately high heat and add the shallots and anchovies. Cook stirring until the anchovies “melt” about 2 minutes. Add a little stock, the tomatoes, beans and basil and heat thru. Stir in lemon zest and season to your taste with salt and pepper. Grill the sausages until they are nicely marked and cooked thru. Slice attractively and place on small plates with the prepared beans.